On last Thursday’s Webinar, guest speaker Mike Parkinson, A PowerPoint MVP and Founder of Billion Dollar Graphics, gave a great presentation on five ways that you can improve your presentations. Mike brought a lot of knowledge to the table concerning presentations (after all, he does them for a living). I will be highlighting high level topics from his presentation below. In most every presentation, you will be showing why a product, method, or ideology is better than others out there. Highlighting the benefits can either be implied or explicit. It just depends on the nature of your presentation and how you decide to display the information. You must always make sure that you tailor your presentation to your specific audience. This is very important when giving the same presentation multiple times to different people. Mike quoted a saying that says, “Facts tell, stories sell.” Stories get people hooked on the information and become emotionally invested in the “product” you are trying to market. You can give an actual story that relates to your presentation and leads the audience in the right direction, or you can visually tell a story by using awesome graphics. Mike used GetMyGraphics objects to display his information that not only conveyed important content but told a story. Once the story is told, make sure to always connect it to the benefits that have been previously outlined. Mike explained cognitive dissonance by saying that if your audience “thinks” they know what you are going to say or where you are going with your presentation, they will automatically tune out the things you are going to say (because they think they already know). Essentially, cognitive dissonance is the art of keeping your audience on their feet. This can be done in many ways, Mike told a fictitious story that was very out of the blue in contrast with the rest of his presentation. And me, as the host of the webinar, couldn’t do anything but listen to his story. I was so caught off guard by it that for the rest of the webinar I was laser focused on everything he was saying; so that in the event something else came up that I would catch it. Cognitive dissonance can also be used by changing the format of the webinar and by using graphics with awesome animations. Simply adding animations that haven’t been used before can keep the audience interested and engaged. When describing visuals and the need for them on almost every slide, Mike said, “Text and graphics work together like a marriage made in heaven. You don’t want one without the other. Unless, there is a clear explanation of the visuals.” PowerPoint, Prezi, Slideshare, and all the other mediums out there used for giving presentations are meant to be visual. You can have text, but if you do, you always need a visual accompanying it. Click here to see some of the great visuals that Mike used in his presentation. A good presenter doesn’t talk the whole time; just as a good teacher doesn’t explain everything. A good teacher and a good presenter allow and encourage an interaction between them and the audience. This allows for the audience to ask questions and to follow up with what has been presented/taught. It is also a great way to keep the audience involved in the presentation (it is hard to sleep and ask a question at the same time). 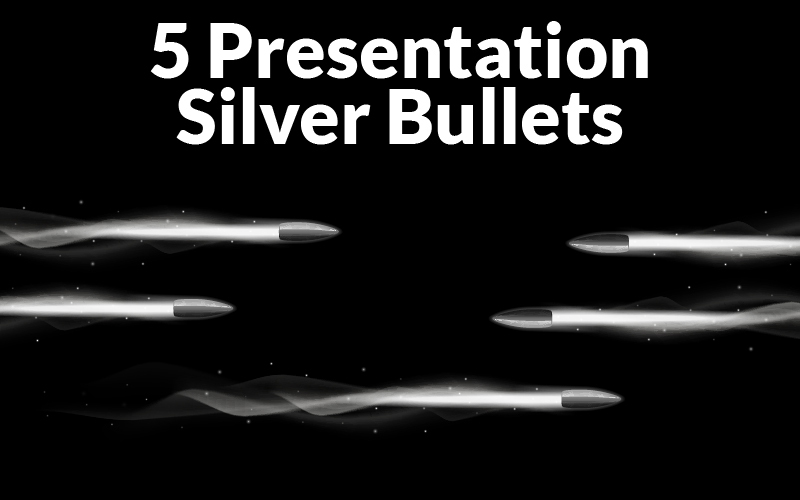 In following and executing these 5 silver bullets, you are sure to improve your presentations and keep your audience involved and interested in what you have to say. Stay tuned and sign up for a free 7 day free trial on Getmygraphics.com and receive access to the GetMyGraphics Newsletter so that you won’t miss a thing.